The Postdoctoral Society of Argonne closed out the first half of 2013 with the Annual Postdoctoral Reception hosted by the Office of the Director on May 13. A speed networking/mentoring activity kicked off this year’s event. Postdocs and Argonne staff learned of each other’s interests and shared career advice in a fast-paced setting to facilitate meeting as many people from across the Lab as possible. Dr. Isaacs shared inspiring words of advice and encouraged the postdocs to keep asking questions. Postdoctoral Program Coordinator, Tina Henne elaborated on why postdocs are “so special” and PSA President Milind Malshe updated the crowd on upcoming PSA events. The second half of 2013 is shaping up to be quite busy for the Postdoctoral Society of Argonne. Preparations for the Annual Postdoctoral Research Symposium and Career Day have begun. The 2013 events will be held on October 10-11 at the APS and TCS Conference Center. Postdoc volunteers will be needed to serve as session chairs, help with the poster session, assist company representatives with booth set up and advertise the event. This is a great way for you to make an impact for the postdocs in your area of expertise! By the way, now would be a great time to get your web profiles started. You asked; we delivered. Postdoc profiles can now be found on Argonne’s Homepage: http://www.anl.gov/science/postdocs. Instructions on how to provide content are provided each week in the Weekend Updates from Tina. If you do not provide content, we cannot create a profile. Please see the Resumes link on the Postdoc Portal and submit your profiles, CV and photo where asked. Instructions and templates are provided in each folder. This is your time to shine! The annual PSA Soccer Outing to see the Chicago Fire take on DC United will be July 20th at Toyota Park. Check out the Postdoc Society’s Facebook page for more details and to reserve your discounted ticket! 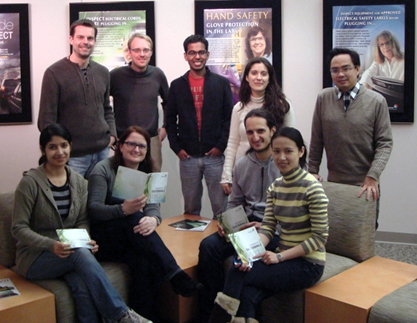 You can make a difference for the postdocs at Argonne by getting involved in the PSA. Right now, your input is needed on the Mentoring Committee to help guide the Mentoring Program going forward. Don’t have time to go to meetings? Do you like to write? Contribute content to the Postdoc Blog. Have connections with your professional society and want to share useful resources? Propose an idea to the PSA Board. Do you eat lunch in the cafeteria? Volunteer to welcome new postdocs on Mondays through the PSA Mentoring Committee. Help others get to know the Lab by contributing to the TWIST Tour committee. There are many ways in which you can use your talents! This entry was posted in Announcements and tagged committee, mentoring, outreach, postdoc, postdoc society. Bookmark the permalink.